Curvy Ozaki Ammonite iPhone 4 dock amplifies sound | What Hi-Fi? iPod docks are two a penny these days, but this one caught our eye with its distinctive shell shape created from shiny zinc-alloy. It's the £80 Ozaki Ammonite, designed speciifically for the iPhone 4. 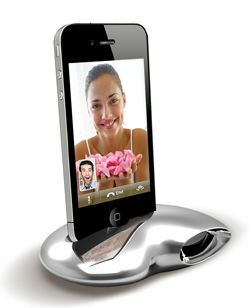 As well as docking, syncing and charging your iPhone from a Mac or PC via USB, it also has an integrated passive speaker, requires no external power and holds the iPhone at just the right angle for Facetime video calls, apparently (assuming it's on a desk or table). The shell-like shape is claimed to "acoustically amplify" incoming music or voices by 15dB, and also enhance the outgoing microphone for clearer phone calls. You can buy the Ozaki Ammonite now from the likes of Amazon and www.audioout.co.uk.